I recently wrote an article, about Thanksgiving, for the Tillamook County Pioneer. It was basically a myth buster discussing facts about the holiday that most of us didn’t already know, including the changes in the menu over time. It would seem unconventional to eat eel, deer, swan or porridge for Thanksgiving nowadays, but that’s what they ate in 1621. Times have changed, and our turkey, potatoes, yams, sugar sweetened cranberries and pumpkin pie are now what most of us expect, every single year, on that holiday Thursday in November. But not all of us rely on turkey as the centerpiece of the meal and many, including vegetarians and vegans, prefer a feast without the meat. The difference in what people prefer and what’s offered in restaurants was made all to clear to me last year. My son and his two children, aged 11 and 19, (two of our dear grandkids) visited us at the Oregon coast for a few days during Thanksgiving. I didn’t really feel up to cooking umpteen hot holiday meals, so I filled a big bowl with nuts in the shell and nut crackers, filled another bowl with Satsuma oranges, prepared turkey breast for post holiday sandwiches, and a pot of vegetable soup, cut up lots of fresh veggies, and baked a couple of homemade pies, hoping this larder of food would last us for a few days. Then we made reservations for Thanksgiving dinner at an Inn in a nearby town. I’d always been reasonably impressed with the food at that particular eatery and hoped the holiday meal would exceed my expectations. When we arrived at the restaurant, I discovered that the meal was a buffet, set on a large table without cough screens; not my favorite restaurant meal presentation. My eleven-year-old granddaughter, a vegetarian, scanned the buffet table for foods she could eat. We inquired to the owner/chef who scowled at us like we’d just stepped off a space ship. Everything contained meat – even the Brussels sprouts. Since there was only meat gravy, granddaughter had plain mashed potatoes and a roll for dinner. And granny paid the full price for her meal. It was disappointing, but we had lots of food at home, so it wasn’t a total holiday meal disaster. The experience got me thinking about vegetarians and vegans facing this sort of dilemma, on a yearly basis, when eating out or visiting friends during the holidays – especially on our bird focused Thanksgiving. With that in mind, I perused the files of my original recipes for some that might be festive and suitable for vegans and vegetarians at holiday meals. The three recipes I’m sharing today are all delicious, holiday attractive, contain common ingredients and can be prepared as either vegan or vegetarian dishes. They may seem a bit unconventional, but looking back, so were turkey, mashed potatoes and pumpkin pie in 1621. Cheers! I won the grand prize, in an Organic Gardening Magazine recipe contest, with this one. Optional: Prepare a homemade whole wheat crust. Roll it out to a 14-16-inch circle. For ease of preparation, chop vegetables using a food processor. It makes this recipe so much quicker to prepare. Heat oil in a 12- inch heavy bottomed pan. When oil begins to “ripple” add diced or chopped vegetables, sautéing and stirring as needed until tender (5-7 minutes) and most moisture has evaporated. Cool the vegetables for about 30 minutes while preparing crust. See #2 below. Add herbs and seasonings to taste. Add chopped greens to pan and cook briefly to wilt, covering pan. Uncover and sprinkle with flour and stir well for a minute or two. 1.If using a crust: spray a 12-inch round metal pan (pizza pan) with olive oil pan spray or coat lightly with oil. Lay crust on prepared pan so the edges hang over. Carefully spread the cooked vegetables evenly over the crust to cover area of pan. Sprinkle with the cheese or baked tofu. 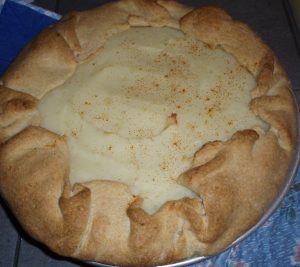 Top with mashed potatoes making a decorative swirl on top; top potatoes with a light sprinkling of ground cayenne pepper, paprika or Parmesan. Rustically fold crust over vegetables including the potatoes. Bake in preheated oven for 25 minutes. Rotate pan and bake an additional 20-25 minutes, until crust is golden around edges and bottom crust seems firm. Cool 10-15 minutes. Cut into wedges. 2.If NOT using a crust, spread vegetables in a 9 x 13 inch Pyrex baking pan or deep dish pie pan that you’ve sprayed with olive oil pan spray. Sprinkle vegetables with cheese or baked tofu. Top with mashed potatoes making a decorative swirl on top; top potatoes with a light sprinkling of ground cayenne pepper, paprika or Parmesan. Bake in preheated oven for 25 -30 minutes or until potatoes begin looking crusty and other vegetables are steaming. Cool 5 minutes. Scoop onto plates. Notes: If you’d like my rustic whole-wheat crust recipe, message me at Kitchen Maven on Face book, and I’ll send it your way. Or, you can find a variety of whole-wheat crust recipes online. The galette is a bit more work than the simple Gardener’s Pie (without the crust), but it is wonderful comfort food and beautiful to serve for a holiday meal or company meal. This original recipe is a vegan knock off of a famous delicatessen sandwich filling. 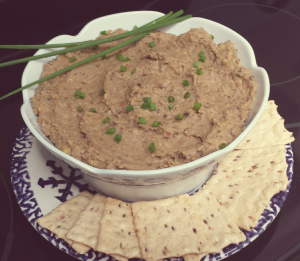 It’s flavorful, hearty and a perfect holiday appetizer to prepare a day ahead. Measure out 1 ½ cups of the cooked lentils for the pate. Use the remaining lentils for another recipe. Melt the margarine in a 12-inch frying pan. When the margarine sizzles, add the chopped mushrooms. Cook on medium-high heat until the pieces lose most moisture and begin browning; add the chopped scallions and 1 Tablespoon chopped parsley, sautéing until the scallions are softened and lightly browned in spots. Sprinkle the tapioca starch, black pepper and cumin into the mushroom mixture, and stir through. Add 1-½ cups cooked lentils and Tamari sauce, stirring the mixture well. Puree the mixture in a heavy-duty blender or food processor, in batches, until the mixture is a coarse puree. Stir well, once again. Mound the mixture in an attractive serving bowl, sprinkle with the snipped chives, and serve with vegan crackers or crudités as an appetizer or in a sandwich with vegan mayonnaise and vine ripened tomatoes or homemade pickles. So good! At this time of year, people seem forever looking for a better sweet potato recipe. Something simple, wholesome (sans marshmallows – please) yet lovely to look at and even better to sample. 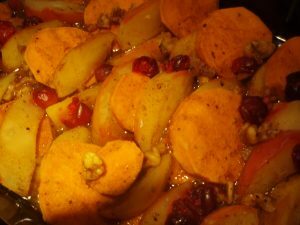 Try this original recipe for spiced scalloped apples and yams with toasted walnuts and Oregon cranberries. It takes about 10 minutes to prep and bakes without any checking and fussing. Pour honey (or maple) mixture evenly over all. Bake, covered with foil, at 375 F. for around 35 – 45 minutes. Remove from oven; uncover and serve. This is healthy, colorful and almost like eating dessert. A good side dish with poultry, pork, or a bean and rice fresh herb pilaf. Serves 4 – 6.